Do I still have a reasonable driving record for a job? I am sorry to tell you but most trucking companies probably aren't going to work with you or even consider working with you. Two words "DUI" "Accident" in the same paragraph, that's all recruiters need too see to determine your unfit to be a driver. Personally I read your post and it seems to me that you don't take this whole incident serious, it's almost if your bragging you beat this DUI in court. CRST, The second chance: Waterloo. The conclusion Okay where was I?? Oh yes the evaluation. Okay basically the evaluation is just that it's an evaluation of your skills by the instructors in Cedar Rapids. If you attended school at the Hawkeye campus , school, then the instructors at the cedar rapids school have no clue where you at skills wise. All the evaluation drive is simply away for the people in Cedar Rapids too see where you are at. Let me a sure you that if you had made that far you will be signing a contract, you will be hired on. Once you pass your three required test. Pre trip and in cab, backing and the road trip portion you have made it. The night classes you attend are to give you more drive time and experience with tighter turns. Once you get back to Cedar Rapids the evaluation as I said is way for the staff there too watch and evaluate you. Now I know some will say but wait I could still be sent home, cut given my walking papers. Okay yes there is a chance that could happen Oh yes you might actually mess up bad enough on that evaluation in cedar rapids they send you packing. This would include you causing a wreck that would send the tractor trailer flying through the air taking out a light pole crashing through a McDonald's finally landing in city hall, throw in multiple twisters and a rampaging dinosaur, there goes your CRST career. The staff at cedar rapids and at Hawkeye have been doing this long enough to know those are going to make and those who aren't. As I said in another response, if they think you are unsafe in any manner pose a threat to the general public as a driver you won't leave the yard at Hawkeye. Another instructor at Hawkeye told several of us students they send people home because they know it's a waste of staff time and energy to train certain people, because they know within six months the person is going to be back to flipin burgers. They can weed people out because of their attitude and effort they put in. Which generally is zero. So that it. If you are a current or future CRST student. My suggestion and advice is to relax. Listen to the instructors, ask questions, as long as you are making a effort the staff will work with you. If you mess up shake it off figure out what you did wrong learn from it and move on. The staff at both schools want you to succeed. That only works if you give 100% own the training. Good luck. 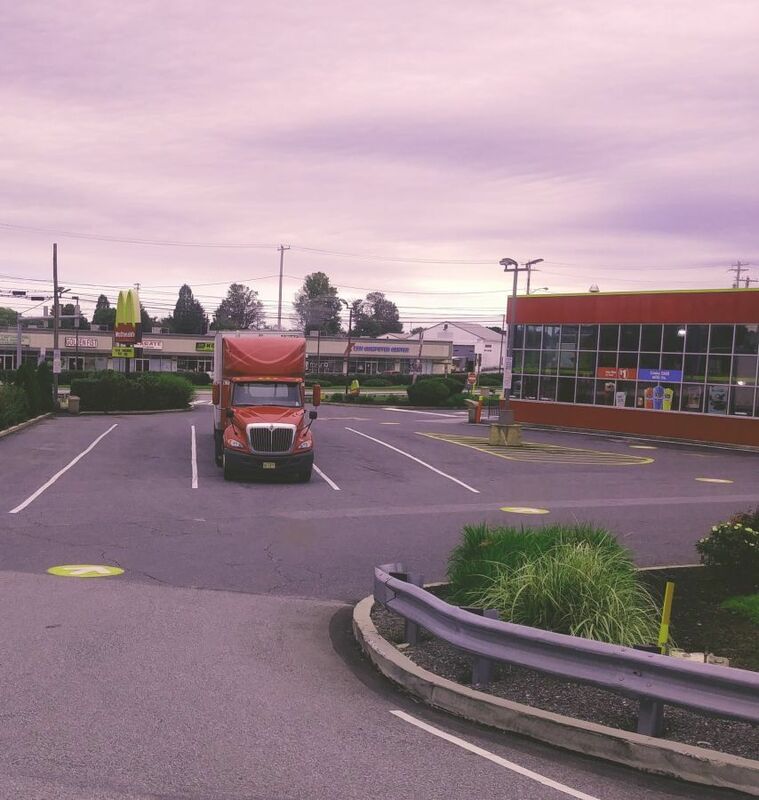 Driving through Gap Pennsylvania saw a McDonald's with truck parking. Rainy's article deserves a standing ovation, well written an enjoyable read. When I left for school at CR.England my wife told me she would understand if I ended up with a second family somewhere else. She said she had done research and found it was common for truck driver's to have more than one family. Before I could respond she started advising me that I plan to have a second wife I need to change a few things, 1) loose the beard,2) dye the hair (I have too much grey, white and silver) and 3 I needed to become more politically correct. So of course things didn't pan out with CR. England. Fast forward a few months. Return home after the road training phase. The wife see's me and shakes her head. "You still have the beard and obviously you weren't listening when I said dye your hair" She asked did I meet anyone? Did I talk to any ladies? I said yes. I spoke to several ladies at the shippers and receivers, I spoke to female cashiers, female employees at subways, burger king, McDonald's, Hardees. So yes I spoke to plenty of ladies while I was away. She gave me a dirty look and said no you idiot I am talking about did you meet anyone you might want to take on a date? I started to answer well there was one girl, uhm never mind, oh wait there have been a couple of girls I guess you could say were attractive, possible dating material for someone The wife sighed and said well we are moving in the right direction. She asked if I talk to them. I ask talk with who? The ladies you meet! The wife said Why would I want to talk with them? The wife glared. So your telling me all the time you were on the road you didn't meet a single person who interested you? I thought for a minute and then told the wife "well actually there was this cashier down in Texas or New Mexico I don't recall the exact area, I just remember walking into this truck and the cashier behind the counter shouted at me that the coffee was fresh! I said we had a cosmic coffee connection! From what I have read it seems that most companies won't consider you for at least three years when it comes to D.U.I's. (If at all). I am sure if you look around you might find a smaller independent company that might give you a chance. Drive Teams or Leave Current Company? Adrian N. I feel for you. Right now we are basically getting by on my wife's salary because I am not making diddly as driver for CRST .30 cpm. My first check wasn't even $100. It would have been over a $100. But I had to take a small advance to get through a week I was sitting waiting for people to figure exactly where I was at and then getting me a trainer at the correct terminal. I have to say when I meet my trainer we hit it off, our attitudes and out look on life from politics, to religion, to music are pretty much what and what. 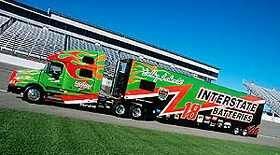 I do remember walking towards the truck for the first time and getting butterflies. I started thinking there is no way I can be cramped up on that thing with another guy. Then when I saw where I was going to be sleeping the first few days, I remember thinking there is absolutely no way I can do this Then my trainer said we were going to Illinois and I was like well I haven't been to Illinois since 1977 so what the heck. CRST has a policy where for the first 3-5 days the trainer needs to be up front with the student driver. So for the first few days we shut down for ten hours and got a fairly decent night sleep. Then came the first time I had to sleep or try too when it was moving. For nearly 3 hours I would just start to fall asleep the truck would hit a bump and I was awake. I think my first night I got maybe a solid 3 hours of sleep. I think by the 4th night I adjusted. The 5th night I played sleep music on YouTube I picked one for an hour and was out within in the hour. I woke up thinking I had been a sleep for an hour and found out I had been a sleep for four hours. My trainer stopped for his 30 minute d.o.t break an hour later. I got something to drink used the rest room we hit the road and he had four or fives hours left to drive. I force myself back to sleep for two of those hours. It's tough by you can adjust to it. How bad will I screw myself? For the most part CRST is mostly teams. However CRST does have solo driver's. My trainer and several other CRST driver's I spoke with all advise me that they had run solo when co driver's weren't available. The best thing talk to your DM and explain you're situation to them. I am going out with my trainer for about two weeks just to get a little more backing experience. Then I have to find a co driver. I have received several calls from people looking for co driver's all of them live in different states then mine including one on the east coast. @BrettV, do what Rob T said. The most important thing is just to relax. Breathe. Remember thousands and Thousands of others have taken the road and passed, come Wednesday. You will become part of that group. I asked my trainer about how to put on chains and he said he actually paid this crew to chain up the truck and trailer , they explained it but he wasn't really paying attention. He said he did it because his co driver had experience driving in the snow and they only put them because it was required. He told me that if the weather gets bad enough that I have to put chains on, then the weather is probably too bad to drive in and it's best to shut down and wait (pretty much what Brett said). Another thing he told me was CRST is messed up in many ways but one area they are on the ball is watching the weather. He told me last winter they got shut down by three different times including one time for four days because of the weather. He explained that if you are headed into area where there is serve weather, crst will do one of two things 1) shut you down and have you wait. 2) reroute you to avoid the weather. Generally speaking though your most likely going to be shut down. I know it's summer time or fall now (I think) But I know winter is coming and that means snow is coming. I have to say I am a bit nervous about driving in it. I am going to take everything I read here about driving in the snow and put it to use when the time comes. Last week we returned to the CRST riverside terminal. I was sitting on the lobby reading an article about this dry cleaners in Mogadishu (I am news junkie , I have the BBC app installed). As I am sitting there one of the terminal managers walks by and goes look "the quiet one" has returned thank God for small miracles. I went pardon me?? He explained that I hardly speak to people when I do I am polite and straight to the point unless I am actually having a conversation. He told me beyond that I am usually sitting somewhere being quite. He said he wish more driver's were like me. He said dealing with alot of drivers at the terminal was like dealing with unruly juveniles. They were loud, messy, rude and complain non stop. none of.that would.have counted as a service failure because you did as instructed. this is why i always always always use the QC for messaging. i can prove it was their screw up. and of course....we still get paid all of those miles. i learned awhile.ago too that when they send you crazy distances for empties, it is often to check the batteries or.tires or because storage fees are racking uo and it is costing per day to sit there. Funny you should mention tires and battery. We deliver a load and got a message to bring the truck back to the terminal. We kept getting a check engine light. We checked the all the wires, fuses, etc (not that either me or my trainer or certified truck mechanics. ) we take the truck and get advised it will be going into the shop for a full overhaul. The truck was in the shop for 48 hours they changed all the fluids. Replace the battery, the alternator which was Appearently not up to par, they even replace all the tires. Felt like a totally different truck. In the morning I got a large coffee, Gatorade (2/$3) and a Danish. Normally ran me $7.50-$8.00. Lunch cost zero didn't buy it while I was driving. Dinner ran about $0-$5 at night grabbed something off the hot food rollers and a drink cost was around $5.00 of course there were nights I went inside to use the bathroom went to get something to eat and realize I simply couldn't do McDonald's, subway, hardees or the truck stop food again. So I would go back to the truck and we would head out. I would be off duty and would eventually go to sleep only to wake up a few hours later hungry. While on the road we had two sit down meals. About a week and half ago we were out in Iowa or Illinois and got sent information for a load to be picked up after sending in the Marco 1 to confirm we would be getting the load , the trainer started putting the information into his GPS unit. Right as he was finishing putting in the information the GPS/ directional guide unit went off line. After failing to get it restarted. We went old school we broke out the atlas (two of them) mine because it's pages are laminate and we could mark on it and the trainers to check low clearance hazards on our route. Turns out there was none. We checked the area were we going to be delivering too using Google maps. Once we got that figure out. We headed out. We actually used Google maps starting out. It had us on the freeway (the I70 going west) which was a normal travel route for us. The trainer advise me to be careful because Google maps has a way of redirecting you into some nasty spots. We had to rely on my phone for directions. About two hours into the run we directed to keep left at certain point (we did as it was the direction we needed to go) then my phone lost coverage. The trainer also didn't have coverage. So we relied on the atlas, kept an eye on the signs and drove on. Finally we stopped for a bathroom break. When we left the trainers navigational system had started working again. It was nice to have it again while I drove. But it was also nice to know I could take the route directions sent to me by the company and find them in an atlas and figure out my way from point A to point B and then to point C. Safely. I got my first trainer in ten minutes. Then I had to go home to get my CDL. I got sent to the CRST riverside terminal where I waited a week for a trainer. During that week I actually got four trainers. The problem was the company's computer system had me listed as being in Cedar Rapids. The first three were in Cedar Rapids, finally they got me one here. Typically the wait time from I saw at CR.England and at CRST was 24 hrs to one week.